Vessels, tanks, and pipelines that carry, store, or receive fluids are called pressure vessels. A pressure vessel is defined as a container with a pressure differential between inside and outside. The inside pressure is usually higher than the outside, except for some isolated situations. The fluid inside the vessel may undergo a change in state as in the case of steam boilers, or may combine with other reagents as in the case of a chemical reactor. Pressure vessels often have a combination of high pressures together with high temperatures, and in some cases flammable fluids or highly radioactive materials. Because of such hazards it is imperative that the design be such that no leakage can occur. In addition these vessels have to be designed carefully to cope with the operating temperature and pressure. It should be borne in mind that the rupture of a pressure vessel has a potential to cause extensive physical injury and property damage. Plant safety and integrity are of fundamental concern in pressure vessel design and these of course depend on the adequacy of design codes. When discussing pressure vessels we must also consider tanks. Pressure vessels and tanks are significantly different in both design and construction: tanks, unlike pressure vessels, are limited to atmospheric pressure; and pressure vessels often have internals while most tanks do not (and those that do are limited to heating coils or mixers). Pressure vessels are used in a number of industries; for example, the power generation industry for fossil and nuclear power, the petrochemical industry for storing and processing crude petroleum oil in tank farms as well as storing gasoline in service stations, and the chemical industry (in chemical reactors) to name but a few. Their use has expanded throughout the world. Pressure vessels and tanks are, in fact, essential to the chemical, petroleum, petrochemical and nuclear industries. It is in this class of equipment that the reactions, separations, and storage of raw materials occur. Generally speaking, pressurized equipment is required for a wide range of industrial plant for storage and manufacturing purposes. The size and geometric form of pressure vessels vary greatly from the large cylindrical vessels used for high-pressure gas storage to the small size used as hydraulic units for aircraft. Some are buried in the ground or deep in the ocean, but most are positioned on ground or supported in platforms. Pressure vessels are usually spherical or cylindrical, with domed ends. The cylindrical vessels are generally preferred, since they present simpler manufacturing problems and make better use of the available space. Boiler drums, heat exchangers, chemical reactors, and so on, are generally cylindrical. Spherical vessels have the advantage of requiring thinner walls for a given pressure and diameter than the equivalent cylinder. Therefore they are used for large gas or liquid containers, gas-cooled nuclear reactors, containment buildings for nuclear plant, and so on. Containment vessels for liquids at very low pressures are sometimes in the form of lobed spheroids or in the shape of a drop. This has the advantage of providing the best possible stress distribution when the tank is full. Engineering design is an activity to ensure fitness for service. 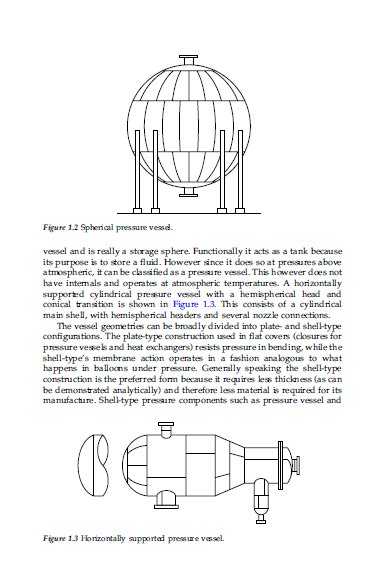 Within the context of pressure vessel design, this primarily involves strength considerations. The ‘‘total design’’ is a topic with far-reaching ramifications. It might include aspects of fuel system design, reactor design, or thermal hydraulic design. 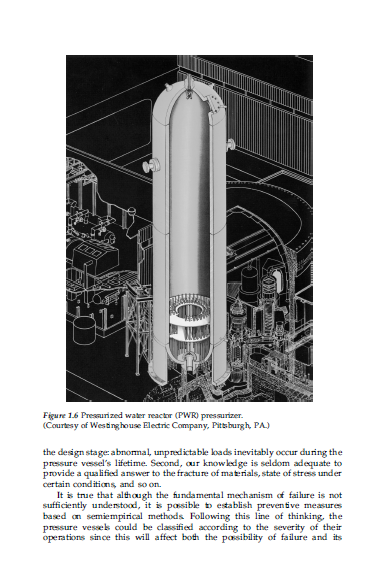 In our subsequent discussions, the underlying philosophy, decisions and calculations related solely to the strength design are referred to the ‘‘pressure vessel design.’’ For certain pressure vessels and related equipment, preliminary design may still be governed by heat transfer and fluid flow requirements. Although the aspect of thermal hydraulic design is intricately related to the structural design, especially for thermal transient loadings, we will not be discussing them in any detail. It will be assumed that the temperature distribution associated with a particular thermal transient has already been evaluated in a typical design application. However, in these cases the designer still has to consider how the desired configurations of the vessel are to be designed from a structural standpoint and how these designs will perform their intended service. The role of engineering mechanics in the pressure vessel design process is to provide descriptions of the pressure vessel parts and materials in terms of mathematical models, which can be analyzed in closed form in a limited number of situations and mostly have to be solved numerically. Even the so-called simple models that can be solved in closed form might involve fairly complex mathematics. In a few isolated instances, intelligent applications of well-known principles have led to simplifying concepts. These concepts have generally eased the designer’s task. However, in a majority of cases, especially when advanced materials and alloys are at a premium, there is a need to make the optimum use of the materials necessitating application of advanced structural analysis. As the complexity of the analysis increases, the aspect of interpretation of the results of the analysis becomes increasingly extensive. Furthermore, a large number of these models approximate the material behavior along with the extent of yielding. As we understand material behavior more and more, the uncertainties and omitted factors in design become more apparent. The improvement will continue as knowledge and cognizance of influencing design and material parameters increase and are put to engineering and economic use. vessels suitable for all environments, but material selection must match application and environment. This has become especially important in chemical reactors because of the embrittlement effects of gaseous absorption, and in nuclear reactors because of the irradiation damage from neutron bombardment. Major improvements, extensions and developments in analytical and experimental stress analysis are permitting fuller utilization of material properties with confidence and justification. 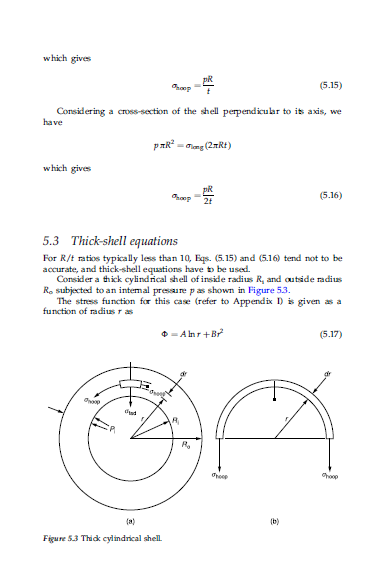 Many previously insoluble equations of elasticity are now being solved numerically. These together with experimental techniques are being used to study the structural discontinuities at nozzle openings, attachments, and so on. This is significant because 80 percent of all pressure vessel failures are caused by highly localized stresses associated with these ‘weak link’ construction details. It is therefore apparent that the stress concentrations at vessel nozzle openings, attachments, and weldments are of prime importance, and methods for minimizing them through better designs and analyses are the keys to long pressure vessel life. Control of proper construction details results in a vessel of balanced design and maximum integrity. 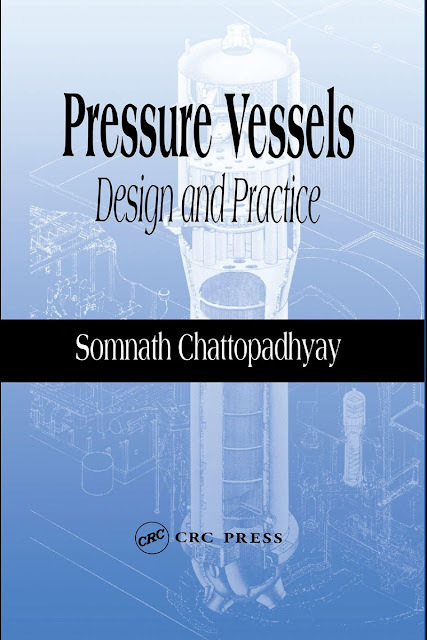 In the area of pressure vessel design there are important roles played by the disciplines of structural mechanics as well as material science. 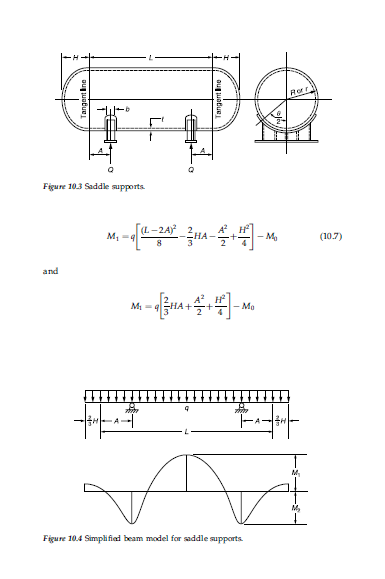 As mentioned earlier, we try to provide a description of pressure vessel components in terms of mathematical models that are amenable to closedform solutions, as well as numerical solutions. The development of computer methods (sometimes referred to as computer-aided design, or CAD) has had a profound impact on the stress and deflection analysis of pressure vessel components. Their use has been extended to include the evaluation criteria as well, by a suitable combination of post processing of the solutions and visual representation of numerical results. In a number of cases advanced software systems are dedicated to present animation that aids the visualization and subsequent appreciation of the analysis. A number of design and analysis codes have been developed that proceed from the conceptual design through the analysis, sometimes modeling the nonlinear geometric and material behavior. Results such as temperatures, deflections and stresses are routinely obtained, but the analysis often extends to further evaluations covering creep, fatigue, and fracture mechanics. With the advent of three-dimensional CAD software and their parametric, feature-driven automated design technology, it is now possible to ensure the integrity of designs by capturing changes anywhere in the product development process, and updating the model and all engineering deliverables automatically. Pressure vessel designs that once averaged 24 hours to finish are completed in about 2 hours. Such productivity gains translate into substantial savings in engineering labor associated with each new pressure vessel design. The typical design of a pressure vessel component would entail looking at the geometry and manufacturing construction details, and subsequently at the loads experienced by the component. The load experienced by the vessel is related to factors such as design pressure, design temperature, and mechanical loads (due to dead weight and piping thermal expansion) along with the postulated transients (typically those due to temperature and pressure) that are anticipated during the life of the plant. These transients generally reflect the fluid temperature and pressure excursions of the mode of operation of the equipment. The type of fluid that will be contained in the pressure vessel of course is an important design parameter, especially if it is radioactive or toxic. Also included is the information on site location that would provide loads due to earthquake (seismic), and other postulated accident loads. When the response is elastic, the structure is safe from collapse when the applied loading is steady. When the load is applied cyclically a failure due to fatigue is likely; this is termed failure due to high cycle fatigue. and cause fatigue failure, termed low cycle fatigue. Such distribution of loads could be of such a magnitude that it produces plastic deformations in some regions when initially applied, but upon removal these deformations become elastic, and subsequent loading results in predominantly elastic action. This is termed shakedown. Under cyclic loading fatigue failure is likely and because of elastic action, this would be termed as low cycle fatigue. When the sustained loading (due to bending or tension) is such that the entire cross-section becomes plastic, gross collapse of the structure takes place. 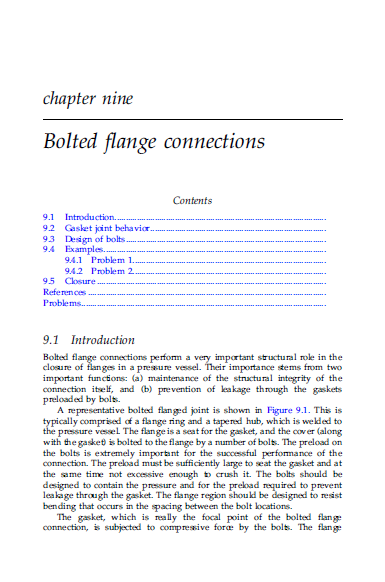 Ratcheting is produced by a combination of a sustained extensional load and either a strain-controlled cyclic load or a cyclic temperature distribution that is alternately applied and removed. This produces cycling straining of the material which in turn produces incremental growth (cyclic) leading to what is called an incremental collapse. This can also lead to low cycle fatigue. Sustained loads in brittle materials or in ductile materials at low temperatures could result in brittle fracture, which is a form of structural collapse. Two basic modes of failure are assumed for the design of pressure vessels. These are: (a) elastic failure, governed by the theory of elasticity; and (b) plastic failure, governed by the theory of plasticity. Except for thick-walled pressure vessels, elastic failure is assumed. When the material is stretched beyond the elastic limit, excessive plastic deformation or rupture is expected. The relevant material properties are the yield strength and ultimate strength. In real vessels we have a multiaxial stress situation, where the failure is not governed by the individual components of stress but by some combination of all stress components.